This is my very first grow. I bought 12 clones and stuck them outside immediately not understanding that they needed to be weened off of lights. After 3 weeks, they started budding prematurely. Now, it's been about 5 weeks since they started budding and 5 of them started revegging on their own. I have mentioned this in a few other posts, but figured I would start a new thread specifically about this crazy grow. Do I separate the 5 revegging plants and start back on Nitrogen rich nutrients? Why in the hell are all the new leaves these single finger weirdos? Why aren't they regular 7 finger leaves now? Should I top these revegging suckers? They are bud on the bottom, weird veg growth on the top. The stalk on these 5 has doubled in size (around) compared to the others. Should I transplant them into a bigger pot? The normal 7 that are just buds haven't seemed to change in over a week. Isn't that strange? What should I do with them? Continue feeding for bloom? ^^^ as said , you will want to trim back to only a couple shoots but that can wait a bit. As for revegging, plants will initially start throwing out the mutated single corkscrew type leaves until they revert back to normal growth then you will start seeing 3,5,7 bladed leaves. Once normal growth returns as mentioned above its best to trim it all back to a couple of good shoots and it will continue on as normal. Okay, @Albannach @Mr.Sparkle so only one has started a 2nd shoot so far and it's really small still. To make sure I understand correctly... I wait until these shoots start sprouting normal leaves then chop off a couple depending on what I want. Feed them very lightly veg nutes for now. Now, what happens to the bud that was growing on the bottom? And, with the "normal premature budding plants" that are not revegging...continue bloom feed? 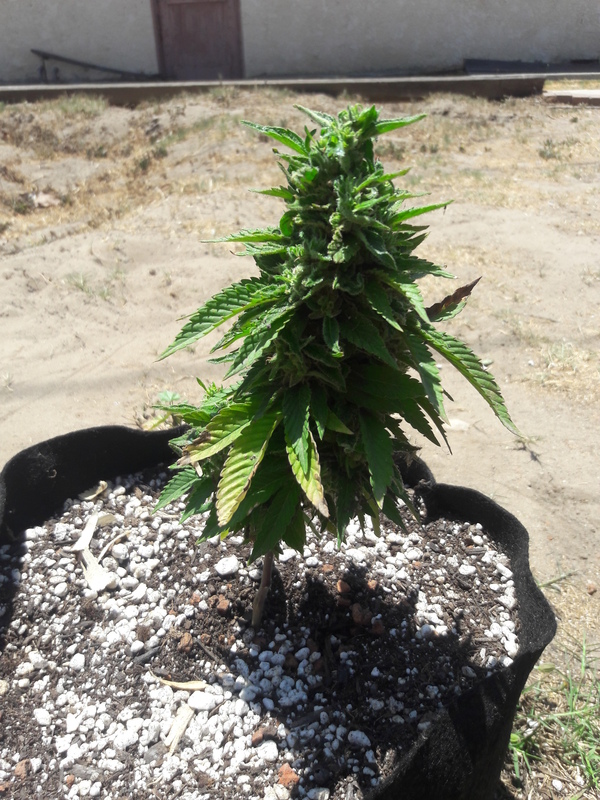 Unless they start to produce actual buds i'd feed them all with mild strength grow nutes every second watering. Now with the 7 plants that are still like pic #1... they have seemed to stop doing anything. The buds seem to be just in limbo. Nothing has changed on them for over a week. So, I just hope that they ripen and I can pull them? what do... >you< ...want to do? if i were making the decisions for you i'd let 5 re-veg'ers go on their own & harvest the other 5 for early smoke. the 5 budders might even start to catch up but not very likely. also remove all the bud from the 5 that are revegging because it'll just get funky by the end of the season. just eat the bud like f'n animal if it's not worthy of much...it'll be a bit funky but you'll like the effect. you can remove a lot of material on the re-veg plants safely like 2/3...i know it'll feel terrible but it should trigger growth response. try experimenting since you're learning & not feeding your kids with it hehe and do 1 different change to each maybe? leave a "control" plant? the "singlet" leaves & 3-finger leaves etc... all show up when the plant transitions back to veg. if you've seen a seed sprout, the first sets of leaves are also singles. i dunno if there's a connection or not. you're experiencing what i was doing a few years ago... very frustrating lesson. do you know why it happened? because they went from (probably) 24hr light to something like 14/10(dark) and that's pretty abrupt. if they had been "conditioned" by easing them a half or an hour a day to get kinda close to your natural light/dark period. read up on cannabis & light period(aka photoperiod). 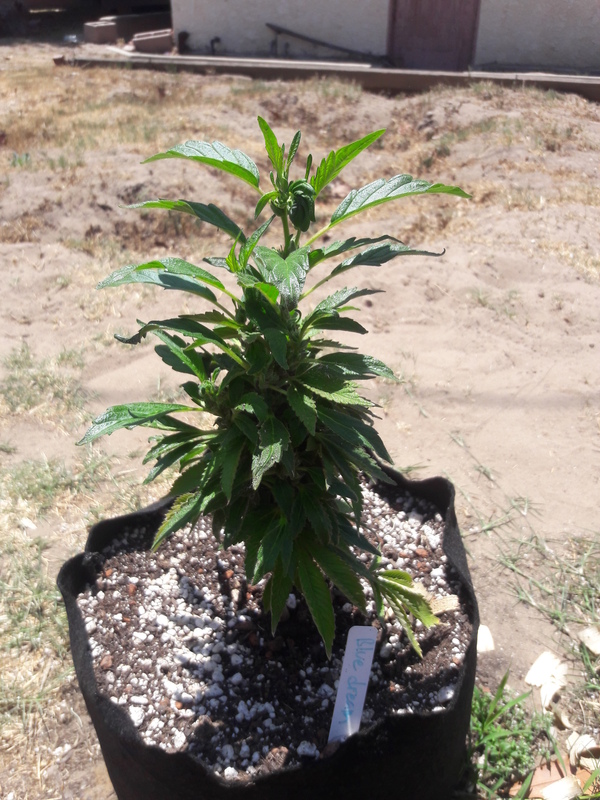 i wouldn't transplant, especially since fabric pot transplants are not gentle to the roots. you can get decent 1/2 lb. in a 15 gal. still i think. ?? OGers? don't bother with the nutrients for reveg now-- it looks like you've got a soil mix ?? i wouldn't bother feeding the bloomers either, just water & harvest. OGers-- notice how closely they resemble auto-flowering plants??...crazy. 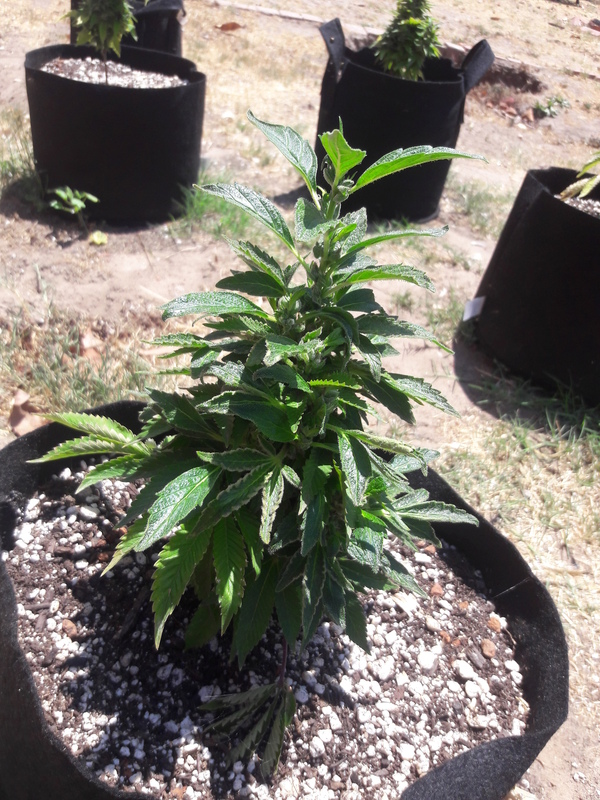 There's the thing, if it's very hot and the plants are regularly being watered heavily they will start to run too low on nutes after a few weeks even in those big sacks. He could do a water - water - feed routine with a weak solution but yeh i'd wait till they were bigger (much) too. Yes. I am completely stupid and didn't realize the clones needed more light than the sun provides and needed to be weened. Now I know. Learning curve. BTW... I'm never effing buying clones AGAIN. I am in So Cal. 14 hours of daylight right now. I understand the photoperiod, and now I understand it with f**king clones too. Basically I'm gonna leave them all the hell alone for awhile... until I can pull off some of the bottom bud and eat it like a wild animal. the 70s & 80s growers took decades to figure out things the hard way, so don't sweat it. you're in an excellent climate, about 500mi. south of me. good chances for a good first harvest & we all wish you well here. Aww thanks! On a silly side note, my cat completely loses his mind whenever I'm in the back yard near the plants. He doesn't touch them, but he meows and bites at me and starts dodging in and out between my legs. The smell must make him crazy! It's hysterical! It's late in the season, so I figured I could squeeze in the autos. Next spring I may till the whole darn back yard and grow some "large" plants instead of pots. Sure do! However the insane Los Angeles traffic makes me wonder if all this sunshine is worth it at times.